As the creator of Urban Asanas, Jyll seeks to diversify the yoga community with classes that cater to every ethnicity, gender, and budget. She bows down to her greatest teachers of all: her children Sierra, Cypress, and Indigo for all their inspiration and love. In line with her dedication to sharing the many benefits of yoga, Jyll has taught students of both public and independent New York city schools. Additionally, Jyll has taught at the YWCA, numerous sports clubs, and select private students. Jyll is a certified Thai Yoga practitioner and a doula. Aasia completed her teacher training at Kula Yoga Project, working closely with Nikki Vilella, Magi Pierce, and Nikki Costello. She began practicing yoga in 2011 in a spinning/yoga studio in Toronto, Canada. Baddhanguliyasana side bend while cycling frantically to Lady Gaga? She knew yoga had to be deeper than that. She moved to NYC in 2012 to pursue a Master’s in Communicative Sciences and Disorders at NYU, completing her degree in 2015. Throughout her studies, she spent several hours per week deepening and enriching her yoga practice in the Ashtanga, Vinyasa, and Iyengar lineages, attempting to find spiritual sustenance and increased focus and discipline in an unfamiliar, transient, and fast-paced vibrant city like NY. Soon thereafter, yoga transformed not only Aasia’s awareness of her own Self, but also illuminated a path to staying present and developing gratitude. She infuses spiritual teachings and lessons on self-building and refinement throughout her classes, creating mindfully-creative sequencing of a purifying nature. Expect an explorative, challenging, and playful practice that will reinvigorate and cleanse the body, mind, and soul. April has studied yoga and mindfulness with a focus on addiction recovery and supporting under-served schools for the past five years. In 2010 she was certified in her 200 HR teacher Dharma Yoga certificationand has since brought yoga into under-performing schools as a means of social justice and peace. She is also certified in Yoga for 12 Step Recovery, a program that connects the spiritual principles of yoga with addiction recovery, cultivating a mind body connection. She teaches yoga and meditation in addiction centers in low-income areas throughout New York City and believes in the healing powers of yoga to resolve past trauma that could have led to addiction. She recently received her leadership training with Off the Mat and Into the World, a program that connects yoga with social justice initiatives. She is extremely thankful to hold space for her students to reconnect with their body and inner teachers through the yoga practice. Living in Crown Heights, she loves how Urban Asanas is for the community and with the community. She is a a certified Laughter Yoga teacher and believes in bringing playfulness to yoga to cultivate inner joy. Corey joined Urban Asanas when doors open to the public in 2015 where he taught and practiced at the same teaching Yoga in public school system . He has continued to find the student in himself through those he teaches . Danielle Olivarez is a Miami transplant living in Bedstuy. Paying special attention to syncing movement with breath, Danielle teaches alignment-based Vinyasa and loves using props to help students move mindfully. Incorporating a mind-body connection in all her classes, Danielle opens each practice with a self check-in and ends with a soothing meditation. Arrive to flow and leave with more focus on your body and heart. Growing up, Erin loved to move. Dancing around the house, practicing karate, and competitive cheerleading. Movement made her feel free. Years later she stopped moving. After a while she lost the connection to my true Self. Yoga|meditation and other lifestyle changes helped her regain her energy, awareness and power within. Her yoga teaching is about connecting to Self, relaxing the mind stuff + physical and sharing the bright light from within. HanaKyle Moranz began practicing yoga in 2004 after a dance-related knee injury. Yoga quickly became became an essential component of her approach to cultivating mental and physical health and wellness. New York City is a fast-paced, crowded, and exciting place to live; in her classes, HanaKyle aims to create a space for respite, exploration, and self-care. She encourages breath-focused movement, with plenty of attention to safe and strong alignment. She is a certified Samarya Yoga teacher, Integrated Movement Therapist, NYS Licensed Massage Therapist, NASM Personal Trainer, and has formulated a line of aromatherapy products for seasonal wellbeing. Holly received her 200 hour certificate at the Kula Yoga Project, working most closely with Nikki Vilella and Magi Pierce. She loves how yoga can empower us to more fully understand our minds, emotions, bodies, and connection with the world. Studying yoga alongside dance has allowed her to find greater depths within each study. She currently dances with Vashti Dance Theater, a West African and contemporary company, and runs her own company, Muliebris Dance Theatre, alongside Samantha Bergman. Holly studied Thai Yoga at Two Souls Massage with Al Turner II. She is excited and grateful to be part of this strong community. Lauren found yoga over 10 years ago during an especially challenging transitional period in her life and has been drawn to its magic ever since. As a classically trained singer, her practice has fostered an ever-deeper connection to her breath, body and spirit that informs both her art and the way she moves through the world. She completed her 200-hour teacher training in 2012 with Ossi Raveh and is truly grateful for the ability to share this transformative practice with others. Porcia is a spiritual healer from Crown Heights, Brooklyn. With her Sun in Scorpio and Moon in Libra, Porcia found the balance of the dark and light side of life and spirituality at an early age. In October 2016, Porcia moved to Los Angeles to pursue a career in the arts. During her time there, she was introduced to different aspects of spirituality and religion. Her first being SGI, which is a Japanese Buddhist organization. Within that organization she learned the power of chanting, meditation, and manifestation which resonates with her today. Over time she started to look follow her own path and studied other religions and organizations and took a deep liking to the occult and its nature. Porcia began a daily practice of meditation, yoga, and tarot and began to understand the flow of life. She aims to heal the hood and eventually the world through meditative energy healing, spiritual guidance, and love. Michelle Yard is a professional dancer in New York City and has been studying Pilates since 2006. It has been an important part of her life and a constant companion for many years. Michelle received her mat certification from Balanced Body in 2011. Michelle teaches a weekly Urban Pilates class as well as additional pilates workshops. Sandy has always been drawn to the way yoga allows her to get playful in her body, but was surprised to recognize just how much she also benefits from how her practice forces her to tune in, settle down, and generate focus and awareness. Sandy’s classes are spirited and energizing, body positive and tailored to a range of levels. She meets her students where they are to help each individual find their own, personal challenging edge. In her classes, students build strength and flexibility at their own pace, and have the chance to let thoughts settle to reveal the stillness beneath the surface of life’s dynamic ebbs and flows. Sandy moved to Crown Heights in 2018 from her home in Massachusetts to pursue her Master’s in Education. She is happy to join the warm and affirming Urban Asanas community. T'ai Jamar Hanna, LMT has been a yoga practitioner since 1996 and a professional in healing arts since 2006. Having been a collegiate athlete and coach; a companion in the end of life process; a health/wellness advocate and a small business project manager, her passion is to facilitate lifestyle design, mindful movement, and conscious breath. She is a senior teacher with Reflections Center for Conscious Living and the founder of Integral Healing Arts. She studied Massage Therapy at Pacific College of Oriental Medicine, graduated in 2012. She holds a Masters in NonProfit Management from Milano, The New School University, 2010. She offers international and domestic workshops, trainings, and classes in yoga therapy, Thai Yoga Massage, and dynamic movement. Whether on a table, on the mat, in classroom, or within her personal relationships, T’ai believes in the power of loving kindness. Shala is originally from Miami, Fl. Four years ago she moved to NYC to become an actress. While searching for inspiration to fuel her art she found love, compassion, and the ability to trust her intuition through yoga. When she took her first yoga class she felt closer to God, which made her feel closer to herself. She had tough times when first moving to New York and yoga kept her grounded. Becoming closer with herself lead her to become a birth doula. Supporting people journey through childbirth is definitely a blessing for her. Shala encourages expecting parents to trust their bodies, and feel empowered. She recently completed a 200-hour yoga teacher training at Brooklyn Yoga Project. 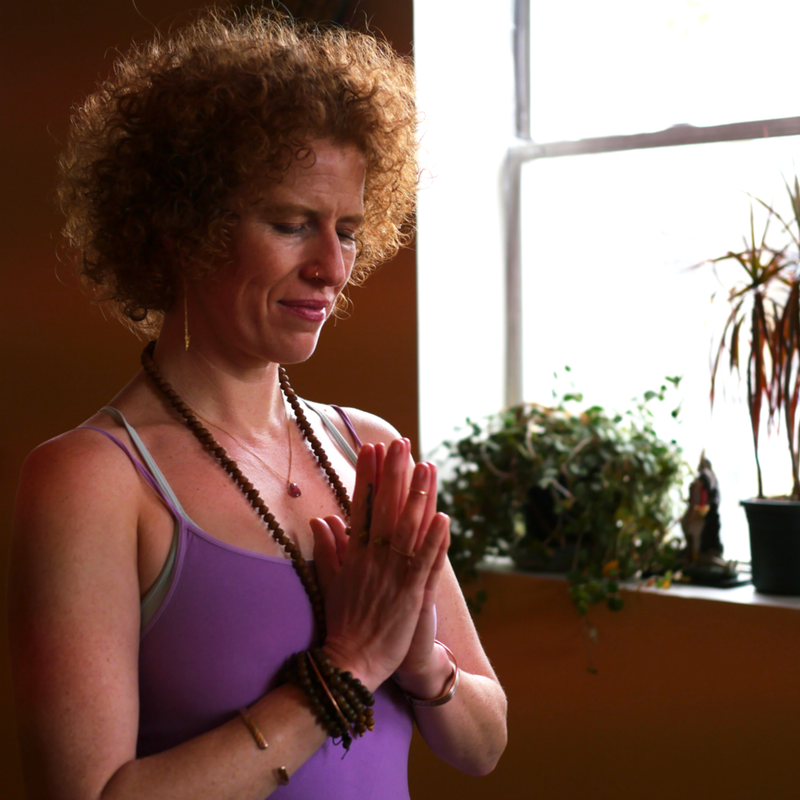 In her Vinyasa class, she guides with compassion, breath, and focuses on the Charkas. Yoga is more than the Asanas. Yoga is a community, an unconditional love for yourself, it's the light when you are surrounded by darkness, Yoga is love. Veronica's yoga journey has been beautifully imperfect. She started practicing Ashtanga yoga in 2008, but was always inconsistent in her practice despite knowing deep down that yogawas her passion. A frustration we can all relate to when we’re in the process of finding ourselves. Eventually, Veronica's heart guided her all the way to Rishikesh, India where she studied the philosophy and practice of Hatha yoga under the guidance of her guru, Vishvketuji. There she received her 200 YTT from Anand Prakash YogaAshram. The path remains imperfect, but her conviction to spread love and support others in their journeys remains fierce. Sylvia started more regularly practicing yoga during her years living in Kenya. The practice was a constant that she was able to keep coming back to to challenge her perspective, spark personal reflection, and soften her heart. Over time, her mat became a place where the worries and anxieties of the day all fell away for one sacred hour. A place where she could stop, take a step back, and look at herself and others in a new light. A place where she decided to love others and herself more fully. With the help of extraordinary teachers at Stanton Street Yoga and The Ayurveda Health Retreat in Alachua, Florida, yoga became a means to open her heart and make it an instrument for fostering compassion in this world. Sylvia is honored to share this special place on her mat with her students. Her classes pair yoga philosophy with flowing breath and movement for an experience that consumes the body and the mind. Sylvia hopes she can use yoga to bring attention to how, and with what intention, her students practice, providing them the opportunity to choose things that serve on and off the mat. DJ emjaynyc, a Trinidadian born Brooklyn raised music-aholic, has been making people dance for a long, long time. Inspired by his parents' musical influences he developed a passion for making a party break into a sweat. An early start as a mobile dj he attained the experience that launched his career from club lounges to dance floors, and made "music, no gimmicks" what he represents. Tara is a Washington, DC-native, brought to Brooklyn by magic and good fortune. After her transcendental meditation studies began in 2006, Tara's passion for meditative movement and the arts became rooted in her professional pursuits. She brings a joy for life to each class, and now as part of the founding team that brought cold-pressed WTRMLN WTR to market, she aims to infuse the broader community with clean hydration alternatives and positive energy.